Lincode siRNAs have been created to support the growing interest in analysis of long noncoding RNAs (lncRNA). 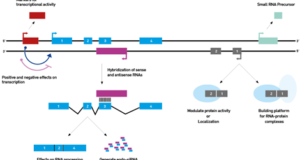 As with siGENOME and ON-TARGETplus siRNAs, which target protein-coding genes, Lincode siRNAs are designed with the SMARTselection algorithm to ensure high-efficiency silencing. Lincode siRNAs also carry the ON-TARGETplus dual-strand chemical modifications to ensure optimal strand loading and reduced microRNA-like seed activity for the reduction of off-targets.